Launching a process of societal transition towards a more sustainable, resilient and adaptive river basin management. Developing a participatory, stakeholder-driven method. Promoting the transfer of BeWater results into policy. Promoting mutual and multi-directional learning among the project partners, entities and actors within and between the river basins and with the broader society. Raising social awareness and promoting a bottom-up approach within the scientific community for planning and implementation processes. Enhancing social participation and building societal resilience. Exploring and assessing opportunities for Research & Innovation (R&I) collaboration between organisations, universities, SMEs and civil society actors to boost innovation in the water sector. BeWater proposes to demonstrate that policies may be developed through a continuous and iterative process of interaction between civil society, scientific and public administrations, including policy makers and implementers, institutional administration and local governments. In this way, adaptation strategies will reflect the needs of society and facilitate greater accountability, transparency and active participation of citizens in the process, which will also enhance the quality and legitimacy of the resulting policies. To achieve this, the project is composed of eight work packages (WPs). Objectives: Strong coordination and management is needed to ensure BeWater’s ambitious and complex project goals are reached, and that the work-plan is realised according to the available budget. Objectives: In order to build the project framework, activities in this WP focus on enhancing the dialogue, coordination and network of the consortium. Objectives: An iterative process will be run in each of the Case Study River Basins (CSRBs), in which work prepared by the science partners will be evaluated, enriched and validated through the participation of civil society. Review the state of the art on water impacts and vulnerabilities and water adaptation in the selected CSRBs and to enrol civil society in the identification of challenges, problems, needs and constraints at local level. Objectives: Adaptation Plans for each of the Case Study River Basins (CSRBs) will be developed in close cooperation with Case Study Partners (CSP) and local stakeholders. Objectives: The experiences and results of BeWater have significant practical relevance for stakeholders in science and policy and for society as a whole. Communication of the work done through the project will be synthesised and tailored for multiple audiences. Objectives: To inform the development of appropriate policies, EU strategic priorities and other related initiatives will be monitored throughout the course of the project as well as policy developments at local, national, European, Mediterranean and African Union levels. Objectives: To ensure the sustainability and continued impact of BeWater, WP7 will assess and make recommendations on the involvement of national funding agencies in target countries and integration with other European initiatives. Objectives: WP8 evaluates the methodology and implementation progress of the project and its potential impacts on society. It includes an in-depth evaluation of the methodology by an internal observer. Facilitate cooperation between work packages. BeWater proposes a new participatory process for the planning and implementation of public policies related to water management, which will make “ad hoc adaptation plans” more feasible. 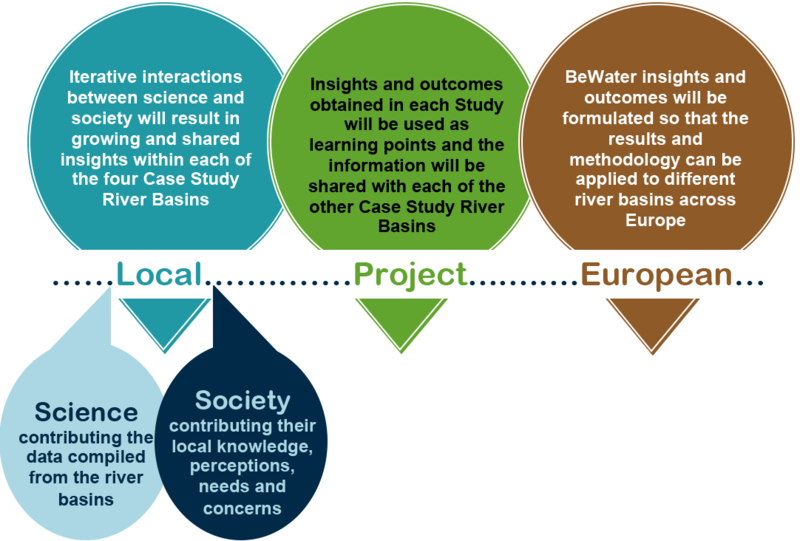 The BeWater general framework is developed at local level through the implementation of case studies in selected river basins, applying a bottom-up approach. The project runs an iterative process in each of the Case Study River Basins (CSRBs), in which the work prepared by science-related partners will be evaluated, enriched and validated through the participation of society through repeated exchanges. Subsequently, the outcome of society’s participation will be integrated into the work prepared by the science-based partners. The iteration process allows that the exchange of information, knowledge and experience between the scientific community and society results in learning processes at different levels: Local, Project and European. The identification of the key problems and needs at local level through an open and transparent participatory process. The basis for a long-lasting partnership between civil society, scientists, and public administrations (including institutional administration, local government and policy makers and implementers) through workshops and networks. An adaptation plan for each river basin system developed through a participative process. The plan, addressed to the river basin authorities, will outline actions that improve resilience and adaptation to global change scenarios. A significant and tangible increase of the river basin systems resilience, measured through indicators. Recommendations for the uptake of the adaptation plan into existing legislation, its implementation and via contributions to future policy actions. Increase of civil society sense of empowerment, having an active role in policy planning at the level they represent. Presentation of the adaptation plan at national policy level in Spain, Slovenia, Cyprus and Tunisia. Active engagement in policy advising and communication at a national level by identifying windows of opportunity with relevant policy makers, beginning with consultations early in the process. 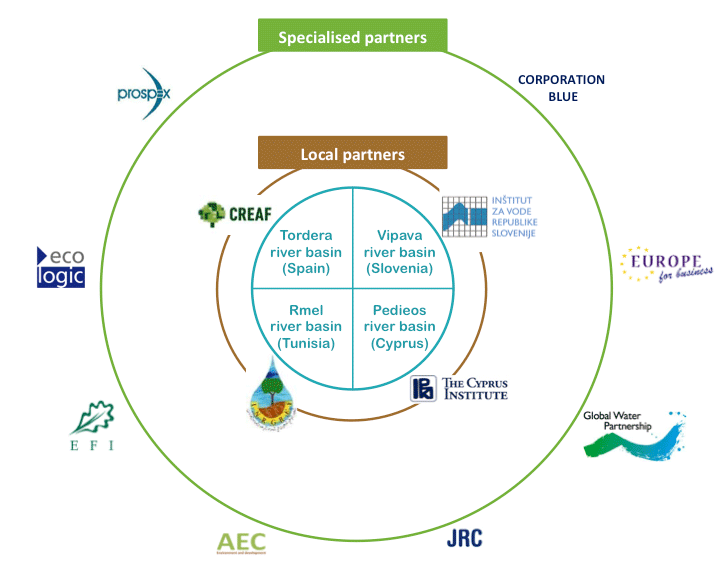 Support the implementation of the Blueprint to Safeguard Europe’s Waters and the Water Joint Programming Initiative at national level by identifying options at this level. Development of a framework for sustainable and effective cooperation between science and society for resilient and adaptive management of water resources at the river basin level. BeWater’s results will be outscaled and transferred by synthesing experiences and knowledge gained through the project and making this available for adaption and application in other Mediterranean river basins. An adaptation plan for each river basin system, developed through a participative process, will outline actions that improve resilience and adaptation to global change scenarios. Dialogue with local stakeholders will be at the centre of the project, informing and validating the scientific research. Information and strategies developed will be focussed at river basin scale, with the aim of reaching outcomes that are applicable or adaptable nationally and internationally. Non-governmental and not-for-profit organisations that have a presence in public life, expressing the interests and values of their members or others, based on ethical, cultural, political, scientific, religious or philanthropic considerations. Climate change is viewed by many as one of the main drivers of Global Change; its impacts will vary regionally and will depend on local environmental and social contexts. Global change refers to planetary-scale changes in the Earth system. Involves continuous, multi-directional interaction between all stakeholders and participants in the project. It is a continuous exchange of information, knowledge and experience between the scientific community (contributing data compiled from the river basins) and society (contributing local knowledge, perceptions, needs and concerns) enabling evaluation, enrichment and validation of the project findings. MMLs are designed to bring together actors from research and the wider community (e.g. civil society organisations, ministries, policymakers, science festivals and the media). They will collaborate on action plans that will connect research activities for a chosen Societal Challenge. Participatory processes and the involvement of stakeholders, scientists and wider society will contribute to multi-directional knowledge transfer. Participatory techniques enable shared ownership of decision-making and close collaboration between the different agencies, sector organisations and different groups of stakeholders within a region. Various methodologies are used in order to facilitate participation on vertical and horizontal scales. transformative capacities to craft institutions that foster individual welfare and sustainable societal robustness in the event of present and future crises. Social learning, participative decision-making, and processes of collective transformation are recognised as a central aspect of social resilience which may be considered is not only a dynamic and relational concept, but also a deeply political one. BeWater aims to launch an innovative process of societal transition towards a more sustainable, resilient and adaptive river basin management. In the project context, transition means a social change in the management of river basins towards the improvement of the basin resilience and adapting to more adverse environmental conditions, which may result from climate change. The key to this project objective lies in its ability to trigger the transition process and to involve all relevant members of society. This project's multidisciplinary approach, which balances environmental, political and socio-economic priorities, will guide water management formulation options that will also serve as a basis for adaptation plan design. Stakeholders in BeWater are groups or individuals that are expected to be affected by the project’s activities and whose actions can have an impact on the realisation of project objectives. In BeWater they are local communities in the 4 CSRBs, river basin managers, water sector actors, decision makers, local, sectoral and regional agencies and authorities, and wider civil society. A Stakeholder Group is established in each CSRB (hyperlink to BeWater Society page) who are actively involved in all steps of the project, from their input in developing the water management options to the validation of the Adaptation Plans and dissemination of the project findings.